Support USA Brand | 60 Days Return | Priority Shipping! Woofer 10 Non-press Cone Woofer. This compact, non-powered sub is not for replacing a decent powered LFE subwoofer, but to bridge the frequency gap often found when trying to pair smaller speakers to a high powered subwoofer. The Model S100W In-wall Speaker Pair are 8-ohm, 100-watt, 2-way in-wall speakers. The speaker frequency response is 40 Hz to 20 kHz. 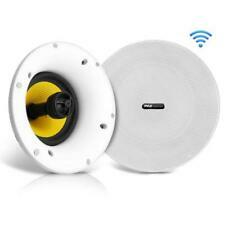 The swivel tweeter permits pointing the tweeter toward the listening area to pinpoint the high frequency sound. Woven Fiber Bulletproof Cone Woofer Provides Low Frequency Tones. Up for sale is this NEW in box 8" in-wall subwoofer. Butyl Rubber Surround For Increased Performance and Durability. Single Voice coil. 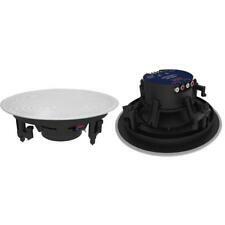 (Impedance: 8 8 Ohms Woofer: 6.5” (165mm). Ideal as a standalone passive speaker for hardwired systems or as an add-on to our All-in-one Bluetooth Ceiling Speaker. Sensitivity (1W/1M): 90dB). Dual tweeters: 0.75” (19mm). 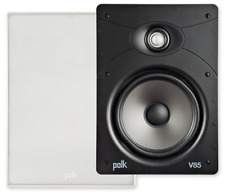 Polk Audio V85 V Series 8?. Vanishing High Performance Rectangular In-Wall Speaker. Virtually invisible, this speaker was made to blend in. This system is equipped with a motor structure perfect for high performance audio. I have two pairs available. 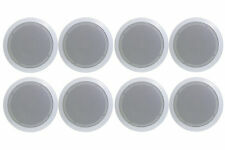 The WS-52T in-wall speakers are sold as pairs. POLK V60 6 1/2" IN CEILING SPEAKER. Like other speakers in the series, the new V models have Wafer-thin Sheer-Grilles™ that are utterly invisible, fit smoothly flush and are acoustically inert for wide dispersion and uniform sound-coverage even in larger rooms. 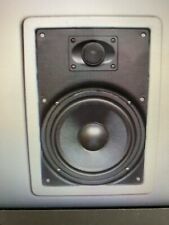 Up for sale is (2) New 8" In wall speakers. Woofer is made out of kevlar material for great response and tweeter can pivot to help angle the sound towards your listener. See below for more information. Ceiling Speakers. Premier Acoustic Speakers. BIC Acoustech Speakers. Mirage Speakers. Energy Speakers. Infinity Speakers. JBL Speakers. Wall Speakers. 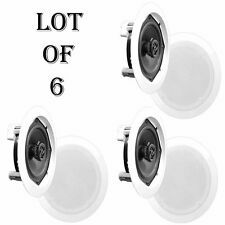 Monoprice Alpha in Ceiling Speakers 8 Inch Carbon Fiber 2-Way (Pair) - 113.. Manufacturer: Monoprice Inc. This carbon fiber in-ceiling speaker is the perfect combination of performance and style. You can fine tune the blend of sound using the built-in high frequency attenuator in case the sound is too bright. 80W RMS 160W MAX. - Woofer: 6.5" Carbon Fiber Woven cone with Rubber. - Tweeter equalizer: 3dB/-3dB. - Max Power : 160 watts. suspension,1"(25mm) ASV coil,18 OZ magnet. - Frequency Response: 65Hz-20 KHz. 80W RMS 160W MAX. › Tweeter equalizer: 3dB/-3dB. › Woofer: 8.0” Carbon Fiber Woven cone with Rubber. › Max Power : 160 watts. › RMS Power: 80 watts. Flush Mounting Depth. IN-WALL MOUNT. AUDIO QUALITY. Lower and Upper -3dB Limits. 8|||| ohms. Nominal Impedance. 32 Hz → 27 Hz. Total Frequency Response.